﻿ Production Capacity - China Wuxi Minghao|China Wuxi Minghao Automotive Parts Co.,Ltd. We plan to add new production line and workshop, go all out for high-end customers with a full range of services and investment. In our existing technology advantage (tooling, fixture), on the basis of comprehensive advantages for using cars in large progressive die, mechanical transfer die, manual transfer die. We plan in three years to achieve annual production of 2500 tons of toolings and 300 vice fixture design and manufacturing capabilities. 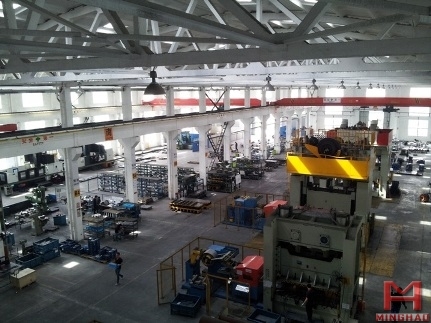 Based on our current high ability to toolings and fixture, rely on constant system perfect and continuous improvement, with the help of existing stamping production project, on the basis of a number of continuous production line capacity, we expect to develop mass production cars and do scale of production capacity of all kinds of assembly parts within three years. In the next few years, we will be committed to the expansion of large and medium-sized automobile parts automatic production and to follow up assembly line, and also complete the Chinese auto industry regional industrial distribution of the plates.